Kentucky — one of the top teams remaining in the NCAA Tournament — will not have a key player for its second-round game on Saturday. The Wildcats face Wofford for a trip to the Sweet 16, and it will again be without sophomore P.J. Washington. 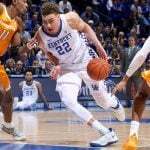 The forward sprained his right foot in a loss to Tennessee last Saturday in the Southeastern Conference Tournament. The 6-foot-9 player of the year candidate leads UK in scoring with 14.8 points per game. His 7.5 rebounding average also leads the team. Washington, whose foot is in a cast, missed the Wildcats game Thursday night against Abilene Christian, which they won 79-44. But coach John Calipari noted in his Friday’s press conference that Saturday afternoon will be different. The coach said that doctors will remove the cast to check Washington’s foot. However, Calipari pretty much dismissed any chance of his star getting on the court. The Wildcats opened as a six-point favorite against the Terriers, and most sportsbooks had the spread down to five by Friday evening. The money line at most Las Vegas sportsbooks showed Wofford as a 2-1 underdog. Tipoff for the game is scheduled for 2:40 pm ET. CBS will broadcast the game, and the NCAA will stream it on its March Madness website. Kentucky entered the tournament a 12-1 shot to win the 68-team tournament after it earned the second seed in the Kansas City Region. Wofford, meanwhile, is a college in South Carolina with an enrollment — 1,672 students — smaller than some high schools. However, the Terriers are enjoying a historic basketball season, earning the school’s first Associated Press poll ranking last month. On Thursday night, Wofford beat Seton Hall 84-68. In winning, they knocked out a Pirates team that beat Kentucky on a neutral court in December. The Terriers hit 13-of-28 3-point baskets in the win, and a similar shooting performance Saturday could lead them to the biggest victory in the program’s history. “The Terriers are one of the best bets for a mid-major to follow in the path of Loyola-Chicago and VCU and make the Final Four,” wrote Sports Illustrated’s Tristan Jung on Thursday. 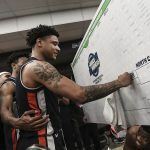 Last year, Virginia made history when it became the first one seed to lose a first-round game. 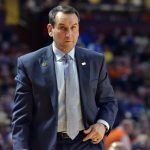 As a top seed again this year, FanDuel Sportsbook said it received limited action on Virginia’s opponent, Gardner Webb. The biggest bet on the underdog was $50. While Gardner Webb held a second-half lead against the Cavaliers, which led to a spike in in-game betting on Runnin’ Bulldogs, history did not repeat itself. 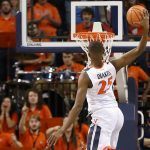 Virginia ultimately pulled away Friday afternoon for a 71-56, although that did not cover the 21.5-point spread on the game. No major upsets to the major title contenders took place on Thursday or Friday afternoon. The highest seed that lost was Kansas State, a four-seed and a 70-1 shot to win it all according to Sportsbook.ag. Marquette, a five-seed, also held 70-1 odds and lost in the first round Thursday to Murray State.